This guide is designed to be an introduction to cases and case law research. Headnotes are summaries of the issues in a case. They are not actually part of the opinion. Each headnote is numbered. Headnotes in a West reporter address a specific point of law in the case, including the relevant facts regarding that point of law. Headnotes in West reporters are written by the editors. Lexis headnotes are a little different from Westlaw headnotes. Lexis headnotes are still organized by broad topics and then progressively subdivided by narrower subjects, but Lexis headnote subjects tend to be broader concepts than the West key numbers. Also, Lexis headnotes do not editorialize, they actually lift language straight from the text of the case. Each headnote in a case published in a West reporter is assigned a topic and key number. These topic and key numbers can be used to find more cases on the same subject. 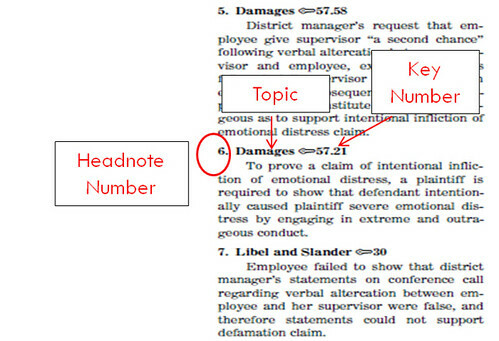 Headnote 6 in this example has been assigned the topic of Damages and the key number of 57.21. 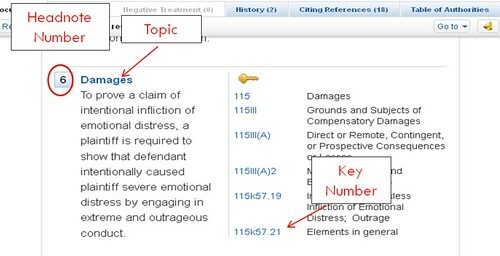 If we want to find more cases that talk about what is needed to prove a claim of Intentional Infliction of Emotional Distress, we can use the topic of Damages and the key number of 57.21 and look online or in a digest to find more cases that discuss this same thing. If you want to see the topic and key numbers in Westlaw headnotes, you may have to click the Change View link at the top of where the headnotes begin. In the image above, we have headnote number 6 which deals with what is required to prove a claim of intentional infliction of emotional distress. Headnote 6 has been assigned the topic of damages and the key number of 57.21. The key number assigned to a particular headnote is always the last and narrowest key number assigned. The Lexis Advance headnotes are numbered but even though this is the same case, the headnotes are not the same as in Westlaw. The headnotes are completely different. Here, we still have a headnote that deals with the elements of Intentional Infliction of Emotional Distress. It is headnote number 5. We also do not have any key numbers. Just topics. We can find more cases on this topic by clicking on the topic links. If we want a broader search, we can use the intermediate levels, for example, we could search Intentional Infliction of Emotional Distress rather than the specific Elements beneath that. A search on any intermediate level will bring up results for all the more specific levels below it. In the image above, we have headnote number 5 which deals with the burden of proof for an intentional infliction of emotional distress claim. There are two larger subject topics assigned to it: Evidence and Torts. Under each larger subject topic there are subtopics. The narrowest topic under Evidence is the Allocation (for burden of proof). The narrowest topic under Torts is Elements (for the intentional tort of intentional infliction of emotional distress). Available to Law Students only (see a reference librarian if you do not have a CALI activation code).